Our first goal in Phnom Penh was to get some laundry done. With 30 degrees Celsius, dusty roads and quad biking we were running out of clean shorts. We stopped by a laundry we spotted last night on our way to the Russian Market. The laundry took a bit longer than expected, so we bought a couple of shorts each for almost nothing at the market. They sold pretty much everything there, but it was crowded and hot, so we didn’t stay to buy anything else. We found a nice café close by with huge fans and sat down for a late breakfast/early lunch to cool down. In the afternoon we went to see The Royal Palace and The Silver Pagoda. 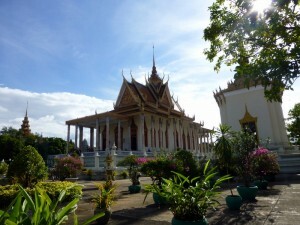 It was a huge area with temples, pagodas and lots of other buildings with the classic Khmer roofs and ornate glidings. We walked from the palace to the riverfront (only a few hundred meters, but hot as hell), and sat down at the first bar we found for a beer. After cooling down a bit, we walked along the entire riverfront and ended up at Wat Phnom (meaning Hill Temple, although the “hill” is only 27 meters high). According to the legend the first temple here was built in 1373 by a lady named Penh to house four Buddha statuse that she found floating in the Mekong. And that’s how the city got it’s name. We took a tuk tuk to Hamiwari microbrewery, located in a 5 star hotel by the river. The service there was kind of slow, but we had a comfy couch, great views of the river, good food, and very good beer. We had a sampler of all four beers available, and were pleasantly surprised with the quality. While we were trying to find the Munich beer garden a new thunderstorm came along, and we jumped into a tuk tuk to go to a microbrewery closer to our hotel instead. When we got there they told us they stopped brewing a year ago, so we took another tuk tuk to the pub street. It wasn’t quite what we expected, and most of the restaurants served western food. We ended up at a small local bar, with European tables and chairs but the kitchen on a cart by the road. Great food! On our way back to the hotel we stopped at a mini mart and bought all the dark beers we could find. The tuk tuk driver didn’t know where to go, but it turned out that we did. 🙂 We enjoyed our beer in the “lounge” at the hotel, while catching up on blogging, reviews, news etc.